So I’ve got all the new zombies integrated into the game now, as well as all of the various different behaviors they can exhibit. Zombies can now also get their heads crushed and destroyed, their arms ripped off, and their legs removed (forcing them to crawl after you). Depending on the occupation of the zombie, it may also carry a weapon or have extra armor. Zombies that wear helmets have to have their helmet knocked off before they’ll take any bodily damage. There’s also a new three-tier wellness system I added (which replaces the old hunger system), which keeps track of your hunger, tiredness and blood levels. Beds that are found (or crafted) can now be slept on, and sleeping can also regain some HP depending on how tired you are when you fall asleep. Explosions and zombie attacks can also cause you to bleed out now, and if you do not find medical attention after the bleeding starts you’ll slowly lose HP and eventually die of blood loss. Other various tweaks to the UI have been made, like popups showing important information and the amount of HP lost/gained after an injury/heal. I’ve also optimized a lot of the background functions controlling the AI. The A* pathfinding algorithms now use about 40% less memory and are faster as well. Here’s a youtube video showing most things mentioned above. Only thing to keep in mind is that the zombies in it are just generic neighborhood zombies, so you won’t see any of the ‘special’ ones like animals, clowns, swat members, etc…but don’t worry! They’re still in there! Seriously Tyson you outdo yourself each update. I love waiting to see whats going to be in each update. I don’t care how long it takes this game to come out because when it does I know the wait will totally be worth it. I think that this is going to be one of the greatest games ever! Amazing. I am completely inspired and jealous of your genius. One thing I still don’t know though, what is the goal of the game? IE. Why should I as a player, keep playing? Are there objectives or any kind of end game? Or is it more of a Zombie Bashing Sandbox? By the way, how will the PC version be distributed? I also wonder about this. Steam greenlight? I was gonna get the iOS version, but I think it might crash on my iPod, and I just recently got a gaming computer. Could we have info on pc version, please? I think Steam (through Greenlight) will be the best option. Once the game gets a little more polished I think I’ll put it up. I like the idea of crits guaranteeing a dismemberment. I’ll add that in! This going to be such a great game, seeing as how it already has more features in it than most “AAA+” titles out there today. Keep up the awesome work! ok thatnks, so there is no respawning if so what happens if i die? I haven’t worked out all of the details yet, but currently you’ll get one chance to play as each character before the game is over. I’d also like to make it so that if you die, the other characters can be used to loot your body. We’ll see. 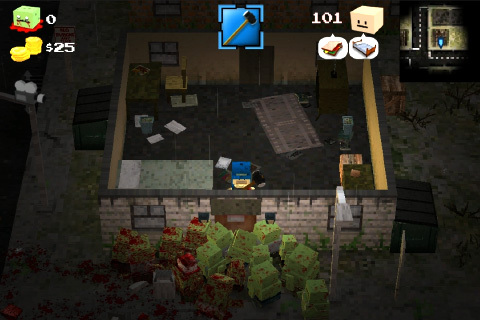 when you begin to bleed, does that attract more zombies to your location? I really love the mix between very basic polygon graphics and detailed textures, combined with excellent and fluid animation. Just great! In terms of hunger and sleep, can you add a bar for each one so you could know how much hunger or sleep you have, but still great game! Will there be a perma-death mode in the game so the player(s) must be more careful and therefore more strategic? Permadeath is on by default. However, as it stands, you can play as all 5 characters before the game is ‘over’…so with each death you’ll lose your character’s progress, but you won’t lose your chance to live in the unique world you’ve explored/built until all 5 characters are gone. But Tyson, did you import some audio yet (Zombies, attack and vehicule sounds)? I would like to hear them . I know youve mentioned it in the past, but PLEASE release a PC version of this. I don’t have an Iphone or an Android but this is by far my favorite indie game currently being developed. Would’nt it be cool if the character is at the peek of death(like 5 health)/or really hungry the ipad screen gets like blurry…indicating hes gonna die..And add heartbeat sound…. and Ty.. can our character fall or fliped(from an explosion) just like npcs..
Looks awesome as usual. Can’t wait to pick this up. Out of curiosity, how do you find developing with Unity3D? It’s a lot of fun! Was easy to pick up and has been easy to use overall. Would definitely recommend! Wow, this looks almost ready to release, probably bugs in it though right? I wont buy your game!!! Tyson will this also be released on android? Amazing job! Can wait! Would be cool if you could crawl through windows, or hide under dumpsters or cars. You could have food rot in your inventory if a player didn’t play the game for a space of at least 1 week. Hey Plz put on STEAM!! Powered by WordPress v 3.4.2. Page in 0.227 seconds.